We are completely different – chalk and cheese. Both of my sisters said this to me before we met and so after getting on so well with Rosemary I couldn’t help wondering if this weeks experience would go as well. I needn’t have worried because Daphne and I hit it off immediately: in fact we all got on like a house on fire. Bear was mostly well behaved and very pleased that Johnny had come too because it meant we went out as a foursome and he didn’t feel ‘left out’. The only disadvantage was that Daphne and I didn’t have much chance to talk together as a twosome but we still managed to learn a bit about one another. 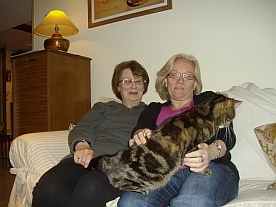 Rosemary and I have plenty in common – ranging from a fear of spiders to an interest in complementary therapies and things spiritual but Daphne and I discovered that we both dislike wearing hats and gloves and both rushed into marriage to get away from parental influence – something we both regretted! Both of my newfound sisters are very straightforward and outspoken but Daphne reckons Rosemary is ‘the shy one’ so when we had a little incident at a restaurant Daphne was highly amused to see that my reaction was more akin to her own than her sister’s. We arrived in Givet about 11.30 and went for a drink at a cafe in the main square. Midday drew near and as there would be no shops open for a couple of hours we decided to stay there for lunch. The manageress installed us at a table by the window and gave us the menus. We chose the set lunch for the day which was a choice between snails or asparagus for the starter, guinea fowl or sea food tagliatelle for the main course and cheese OR strawberries to finish. A few minutes later another couple came to the table next to us and gradually the restaurant began to fill up. We ordered our drinks and then the starters arrived. The couple next to us didn’t have a starter and so were tucking into their main course. They finished, had dessert and coffee and we were still waiting for our guinea fowl and pasta. At first we talked about the two hour lunch break – the French leiurely lunch – but as more food found its way to other tables I caught the attention of the waitress and asked if our meal would be long. “If our’s isn’t here in five minutes I suggest we leave” I said to the others and they agreed. At half past one there was no food so I went to the waitress and told here we were not prepared to wait any longer. We would pay for what we had eaten and leave. “But it’s just coming” she said. “No, we’re not hungry any more.” was my reply. We went to the counter to get our bill but there was already a queue of (satisfied) diners waiting to pay. Daphne and I went to the toilet but when we came out there was still no sign of the bill being ready. The chap next to me repeated her words as “C’est bon?” meaning “is it OK?” so I launched into my complaint about it definitely being PAS bon to be kept waiting for an hour and a half. The manageress came nearer and hissed “Vous pouvez sortir.” – you can go!. So off we went with Daphne laughing her head off at witnessing my stroppy side ( and saying she’d have joined in if she could speak French) while the menfolk were delighted that we had enjoyed several drinks and a pretty good starter ‘on the house’. Daphne and Johhny’s stay was only a few days but we packed in much more than we had done while Rosemary was here because of the miserable weather. 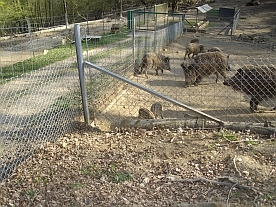 However, we did see real boar in contrast to the monstrosity ‘parked’ by the Reims-Charleville motorway. The big ones fought one another for pieces of bread thrown into their compound and even the babies tried to slip between their feet to get a few crumbs.The little ones (called marcassins) are very pretty with stripey coats. It has been a real pleasure to meet my two sisters and I’m sure we’re going to make up for lost time now that we have found each other at last. I’m really looking forward to seeing them both again. While Jay and I were taking Rosemary back to Brussels a letter came asking us to present ourselves at the Gendarmerie at 14:30 on April 15th. We assumed it was about the problems our postlady has been having with a neighbour but I must admit, it crossed my mind that it could be something more serious – a driving offence perhaps? I needn’t have worried because when we arrived this afternoon, a very pleasant young lady gendarme let us in and asked how she could help us. “We’ve been summoned to see Mr Gendarme Martin” I said. “That’s me,” she smiled and after keeping us waiting a few minutes she took us through to a small office where we squeezed in between the files to sit in front of her desk. I plonked the large English-French dictionary on the corner of the desk in case we had translation problems but she took our statements and typed quickly as we spoke. Jay preferred to say it in English and have me translate but she didn’t find that a problem. Neither of us could remember the date or the exact time of the incident so she must have thought we were pretty useless witnesses. She finished by asking each of us if we had ever had any problems with the postlady or the neighbour in question and we both said that the postlady was always smiling and charming but also had to admit that we had never, personally had any difficulties with the man opposite. She printed out what she had typed ( correcting my grammatical errors) and we read and signed them. Claudine, our neighbour, has also been summoned but she says she dare not get mixed up in it because it wouldn’t do to get on the wrong side of Mr M. Oh well, we’ll have to wait and see if he decides to put a brick thorugh our window. Some of the cats dashed indoors all of a sudden but Willow sat transfixed on the steps outside the conservatory. I went out to investigate and saw this ratlike creature cowering in the corner at the bottom of the steps. As I went to pick Willow up it went for me and landed on my foot ready to take a bite. I grabbed it by the tail but it twisted itself up and bit my finger. Naturally I dropped it but it squealed angrily and junped a couple of feet in the air obviously feeling threatened. All I could thnk of was to make a lot of noise as this litle creature was pretty courageous and rather fierce for its size so I was pleased when it ran behind some large stones to hide. My finger was bleeding but I took Willow indoors and then went to find Holly but she ran off. Meanwhile CC came to the window and watched the little creature as it moved around behind the stone. It was the size of a small rat but it didn’t have a pointed snout and it’s eyes were larger and set more forward than a rat’s. However, it had two very prominent front teeth and I can vouch for their sharpness. After cleaning and disinfecting the bite I rang the doctor to see if there was a danger of infectious diseases. Having ascertained that the wound wasn’t deep enough to require her attention she told me to report to the hospital this morning and to ring the secretary first. Bear duly drove me there at 8.30 and I had to go to ‘Admissions’ to show my Carte Vitale, Insurance card and passport. I was given some papers to take to the outpatients clinic and we waited there until the doctor arrived just after nine. The was a young lady who went in first and then it was my turn. He assured me that there was no danger of rabies from rodents so an injection wouldn’t be necessary but as they could carry rather nasty diseases he has given me a weeks supply of antibiotics – with a warning that one of the side effects could be diarrhea. Great: we’re hoping to go out and about this weekend when my other sister comes to stay. You may be wondering why Rosemary signs her comments as The Energy Healer so perhaps I should say something about this aspect of my sister but I hope she will leave a comment if I’ve given the wrong impression or misinterpreted anything. She told me our dad was a healer – ( I have to admit this surprised me) – and that she, too had trained to be an energy healer because she had always been interested in the way he could help people. It didn’t stay low for long, though but I have to admit it didn’t go up into the 190’s as it had done. Rosemary said it would be better if we arranged a time so that I’d know about it and could be in a relaxed and receptive frame of mind. However, that wasn’t as easy as it seemed. We decided I would call her one evening and then go and make myself comfortable on the bed. But, would you believe it, after feeling the excitement of anticipation all day I fell asleep in front of the telly and was woken by the beeps of my mobile when she texted me! Covered in confusion I tried to settle down on the bed but despite the fact that I had told Bear what was going on he came bumbling in a few minutes later, turned the light on and announced he was coming to bed. So I went back in the living room and relaxed on the armchair. Guess what – Bear came through, switched on the light and started talking about this and that (I really can’t remember what it was). I gave up, rang Rosemary and explained the difficulties. “Oh well, it wasn’t meant to be” was her calm response. Nevertheless I have personal experience that distance energy healing definitely works and Rosemary told me how she had sent energy to a friend’s daughter after she told her that she had been ill for several days with some sort of virus. It seems her friend went home and found the little girl had suddenly recovered so she accused her of putting it on to get out of school. She later read an email from Rosemary telling her that she had sent some healing energy at the exact time her daughter got better. Obviously, I wanted to talk to Rosemary about this subject but it is far from easy to understand. She explained that we are made up of energy like everything else on and including the Earth. What she said was fascinating but difficult to get my head round. To really understand it takes serious study and commitment. I’d like to delve into it but have to admit I’m lazy about devoting the time and self discipline required although I have read some of the books and articles she has recommended. It wasn’t possible for the two of us to get away from the family for long but Rosemary did give me a session of Chakra healing. This involved working her way up from my feet to my head. The strange part about this was that there were times when it felt as though she had more than two hands. She explained that the angels and spirit guides could often join in and lots of people had this experience. Among the presents she brought over were some crystals for calming and since wearing them I have to say my blood pressure has behaved much better. No doubt the Healing session played a big part as well. The next thing I’d like to try is meditation but, for me, it’s really difficult to get into the right frame of mind. Maybe I’ll have to wait until I see Rosemary again. We are just back from taking Rosemary to Brussels for her train back to London. On the way we didn’t chat as much as we did coming home 11 days ago. There must have been 1001 more things I wanted to ask but I felt a bit empy knowing that this was the end of a delightful time spent getting to know my sister but, of course, we’ll carry on emailing and phoning as we have since we first found each other. 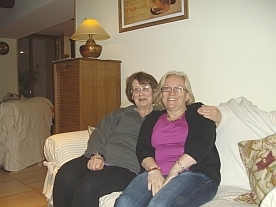 The first week of Rosemary’s stay was grey and wet outside but very warm indoors while we exchanged photos and told each other about our lives and families. Exactly as I’d hoped, it felt as though we had known one another for years. Rosemary was ‘one of the family’ right from the start. She simply fitted in immediately. CC and Jay took to her straight away and even Bear was charmed – and charming most of the time! Whale was pleased to meet a new face and someone who took a real interest in him and what he had to say. On Easter Sunday our friends from the next village came for lunch and Rosemary witnessed a somewhat chaotic version of my entertainlng. The main course of stuffed turkey escalopes was an experimental dish that would definitely not have earned me a place on Masterchef. Between us, Bear and I managed to drop the peas all over my lap and the floor and I forgot to warm the plates so the meal got a bit cold before we could finish it. Jay, on the other hand produced some super meals with his well tried recipes like aubergine bake and fish pie with a crispy topping – not to mention his delicious canapes such as prawns with hardboiled egg and smoked trout and cream cheese on blinis. So, apart from all this talking and eating what did we do? Well, once the rain had stopped we ventured into Charleville to show Rosemary round but it was a much more interesting day out when we went to Reims by train. There was a slight ‘Bear moment’ when he made it clear he wanted to come with us but felt that we didn’t want him. In the end we left it to him to decide whether or not he was coming so that he wouldn’t accuse me of leaving him out. His knee was playing up so he stayed at home but then, as it was the first sunny day for ages, Jay and CC decided to put Whale in the car and drive to Reims to meet up with us. We had just finished lunch (outside in the sun) when they emerged from the underground carpark nearby. Unfortunately Whale has to use his old, decrepit wheelchair when he goes out in the car and Jay had a very hard time pushing him over the many uneven surfaces but we visited the cathedral and looked in numerous shops before driving back together with Rosemary, CC and me cosily squeezed into the back seats. 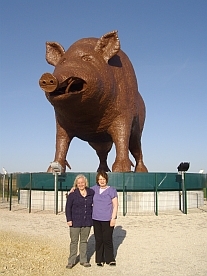 Jay stopped off to take photos of Woinic, the monstrous boar which is a symbol of the Ardennes. ‘She’ was going rusty so they have painted her a horrible brown colour. The next day we suggested that Bear might like to take us out for one of his scenic tours. He readily agreed and actually drove quite safely so that, for once, I wasn’t sitting in the front seat gritting my teeth. 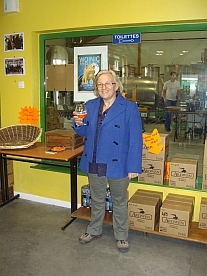 He took us to the local brewery so that Rosemary could buy some beer and glasses to take home for the men in her family. We tasted the latest brew – called Woinic (8.8 per cent alcohol) – but Bear stuck to coffee and soft drinks! The time went far too quickly and as Rosemary has a fulltime job and a couple of weddings coming up I can’t see her being able to come back for quite a few months but she has promised that she will, and of course we’ll keep in touch. And, of course, our other sister, Daphne, is coming for a long weekend next week so I’m meeting them both in quick succession. My stay with my sister Sandy and family. During our previous conversations and through reading her blog I had been warned of the various personalities. On the day I arrived we had a fantastic welcome meal the French way. It didn’t take me long to realise that to survive in this household you need an unlimited supply of tolerance. However putting all that aside, I felt I had known Sandy most of my life: CC and JJ were lovely and between the three of them I was fed and watered with wonderful culinary delights. I will even be taking recipes home with me. Bear – well what can I say, considering what I had been told in advance he was very well behaved. We had a couple of times when he showed his “I’m here, you’re ignoring me” personality. Whale, Sandy, CC and JJ will probably not agree with my comments. However, I felt sorry for Whale at times but having had several conversations with him, I found he was easier to communicate with than the Bear. I possibly need to learn some more about History though for my next visit.